You also get $200 of an unlocked full retail price. Also the Galaxy Watch is $70 off. I will definitely be choosing Best Buy over Target. I don't believe Target has the 46mm Galaxy Watch on sale. Just the 42mm Galaxy Watch. If you belong to Costco, their watch deal is $10 less and sale starts a week earlier, 11/16. Their packaging usually includes something extra too. When they had the gear sport, they included a 2nd charging stand. Just checked...includes additional charger. Or you can grab the Frontier for $190. Anybody ever taken advantage of the Costco cash deals (like the $300 they're offering for Note 9)? Saw an add suggesting it can take up to 14 weeks after mailing in the required documents. I'd much rather it be simpler like Target and have the gift card in hand right away, but I like the idea of not having to wait until actual Black Friday. Does this promo require Trade-in to get $300 off? If you are asking about the Target or Costco ones, no. Just special Black Friday deals. Am I reading this correctly? 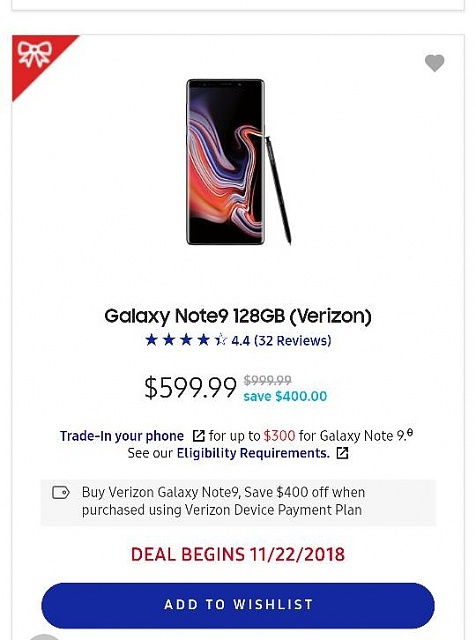 Is the Note 9 going to be 50% off for Black Friday if bought through Verizon’s payment plans on samsung’s website? Link please. This would be great!!! So if Samsung.com sells an unlocked Note 9 for $799 on BF, what are the chances that Amazon will sell for same price? 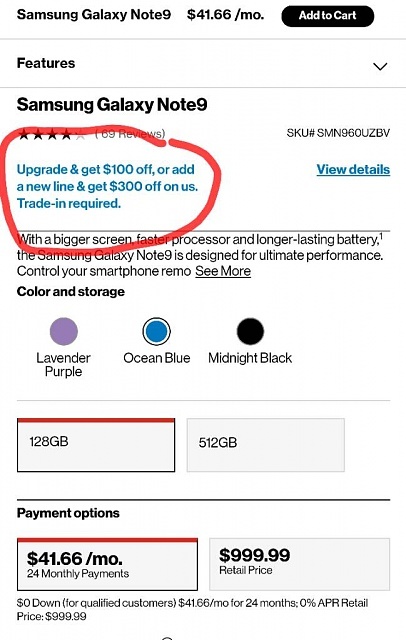 Knowing Verizon, that looks to me like a $200 sale price, plus $300 trade in with new point activation (otherwise it's likely only $100 trade in credit), for a total savings of $500. That would be technically half off, but you'll also be paying extra for another line for the duration of the payment plan. 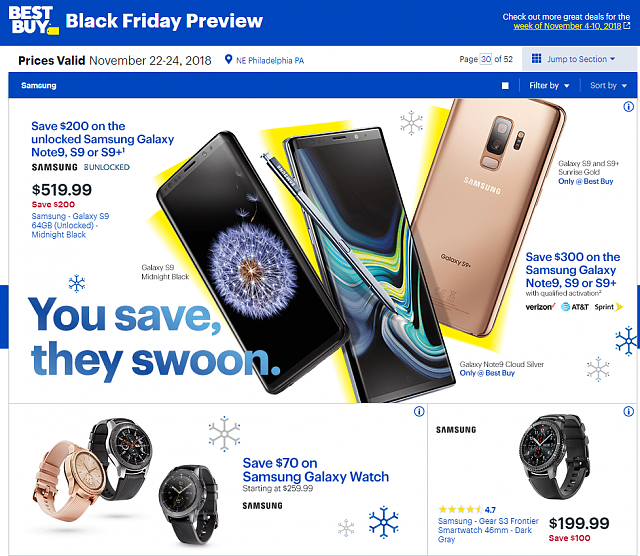 Never mind found it on the Samsung Black Friday page. So you don't think it's 1/2 off for monthly payment. That's a bummer. Not a straight up sale price, no. This is from Verizon's site, so I suspect the same applies to Samsung. I could be wrong, but just my educated guess. The unlocked deal is appealing but the endless wait for updates is a worry. Your saying Amazon is only selling Verizon and not unlocked for $799? Was referring to the picture of the Samsung site deal above...it's the Verizon model. Correction: looks like Samsung will offer $200 off the unlocked model also. This is very interesting. 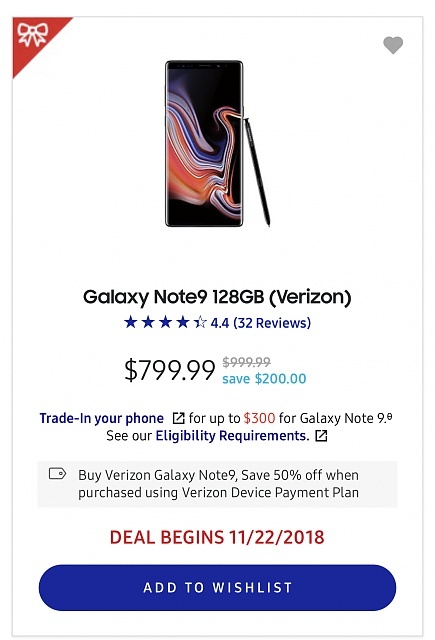 That is still the best deal for the Note 9 on Black Friday. Hands down. I have never ordered from Samsung’s website though. I wonder what their return policy is like (with restocking fees and such) and their how long shipments take to arrive. Agreed. Was originally planning to get the $300 gift card from Costco but this is better, even though the discount will be spread out over time. right.. but i am wondering if Amazon will match this price.. I have an Amazon card already and can finance for 12 months in addition to using a bunch of Amex gift cards i have towards the purchase. Makes sense. They'd be foolish not to match that offer or offer something better. Already down to $930 right now.